This weekend is a celebration. 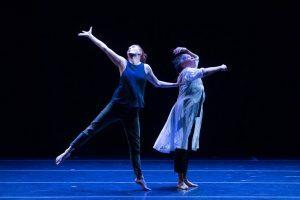 The 35th Anniversary Gala brings together artists who have been integral to the festival’s trajectory, replenishing and reinventing the spirit of BDF summer after summer. The celebration centers on the pillars of BDF, Marcy Plavin and Laura Faure, the two women responsible for nurturing the festival into what it is today. These indomitable women pioneered a community bonded by a love for movement and a commitment to cherish the individual, together. To Marcy Plavin, the founder of the festival 35 years ago, we say goodbye, we lovingly reminisce. To Laura Faure, the director of the festival for the past 30 years, who we lovingly celebrate, we say good luck. To both, we extend our deepest gratitude in the best way we know how: moving together. It feels only right that Bebe Miller returns once again to the festival, as she is the artist Laura first brought thirty years ago. 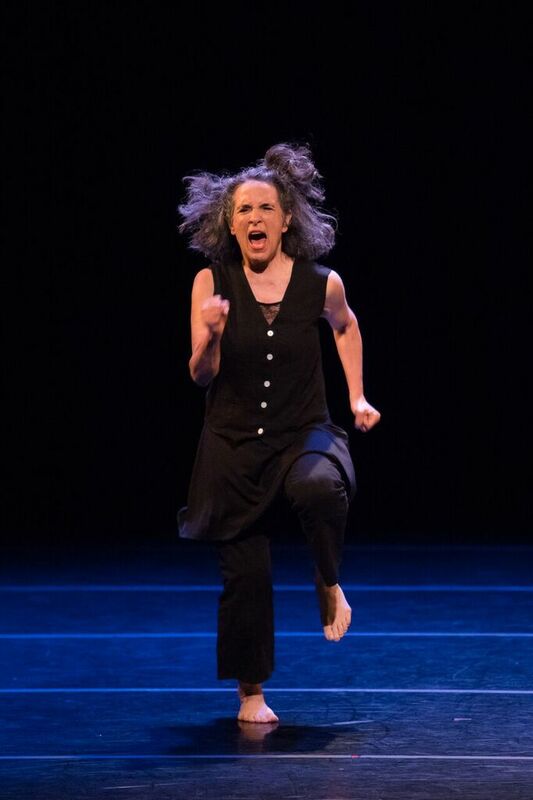 This weekend she performs “In A Rhythm,” an excerpt from a new work in process. Miller and longtime collaborator Angie Hauser come together for an intricately woven improvisatory duet that reads like a conversation. The two women navigate a relationship rooted in language and physicality, juggling who is speaking and who is moving with care and reactivity. Their presence is consuming, their focus palpable. 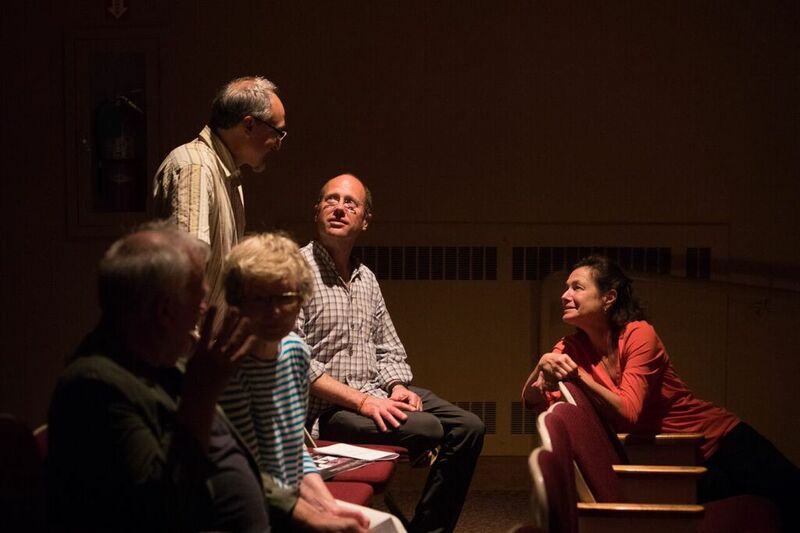 They are firecrackers, astutely perceptive to each other and the audience, continually nourishing the experience of making and doing with the experience of being watched. It is a sophisticated game of freeze dance, one with malleable rules and a buoyant sound score. The tone of reactivity is set from the beginning, when the two women are revealed onstage, both listening to the same device. The audience cannot hear, only the performers can. We are privy to this mystery only when they speak, Bebe and Angie, when they are awoken from their own listening, speaking phrases one can only assume have just been placed in their ear. The duet, although from a new work, is heavy with history, performed from a deep place of knowing, making the unknowing so satisfying. A Maine native, Riley Watts makes his festival premiere alongside longtime festival musician, Carl Landa. “Tonight’s Pattern” comes and goes in a flicker, ever-shifting and constantly renegotiating. 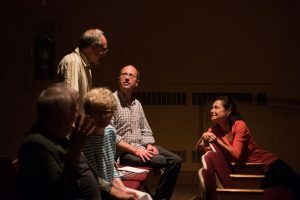 It is an improvisation reliant entirely on memory and the present moment, emphasizing surprise, recognizing the sensation of being watched, and remembering the night before. Watts responds to the moment, constantly folding in on himself, never collapsing but expanding outward. 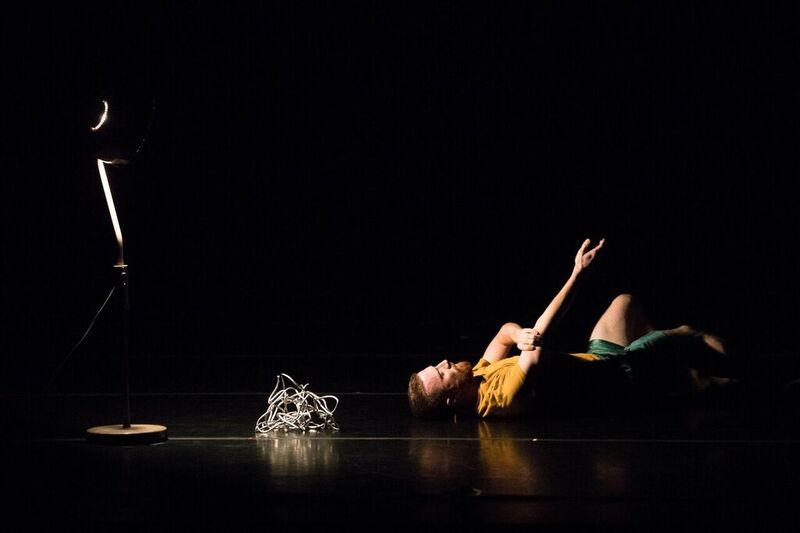 It is a stream of consciousness, a deeply inquisitive investigation of dance thinking rubbing up against performative circumstance, demonstrating a technical prowess and an agility of thought. Through his physicality, you recognize the power of his mind. Watts expands into a superhuman and flashes into a firefly, redefining the trajectory of his solo, entirely contingent on this stage and this night. It is in the doing that the idea comes. The first move starts a journey, a spiraling and paradoxical train of thought that can only be resolved through the body. Circumstantially intuitive and technically stunning, “Tonight’s Pattern” is all consuming; inescapable and fully intangible. The rest of the program is characterized by thought, play, and investigation. Larry Keigwin opens the show with a playful solo to lively music that invigorates the space. Patrik Widrig’s “…And Still Doing…” is dominated by a sense of urgency in physical intent accompanied by a strategic perplexity in spoken word. In “Dr. Pearson’s Guide to Loss and Fear” Sara Pearson sketches an autobiographical narrative emphasizing didactic textual impetus in a rooted bed of movement sensibility. She loses track and tracks her loss, her fear. 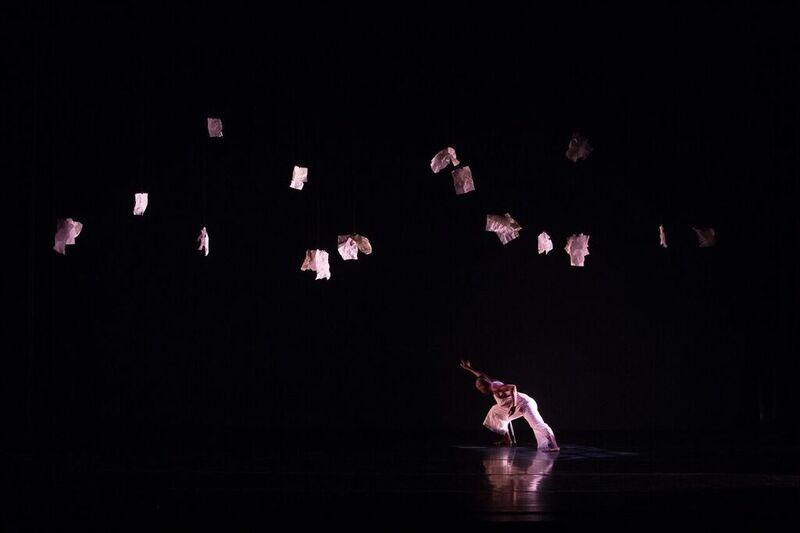 Tania Isaac’s words vibrate through the theatre and white crumples hang from the ceiling as she navigates the space below, excavating herself between her words and her movement. Doug Varone’s poignant duet with Natalie Desch illuminates the facets of a deeply personal relationship. 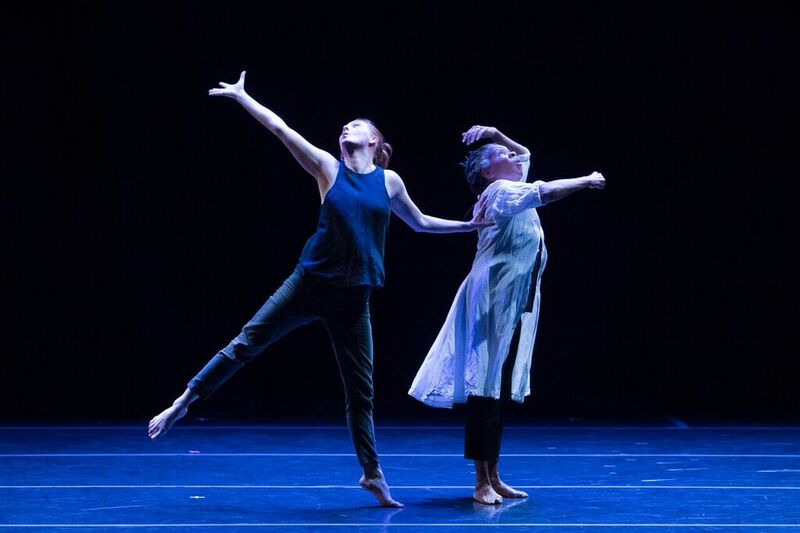 The evening closes with a group work created by Michael Foley on students of the festival, an intricate weaving of partnering and sensibility, a love letter to his mentor Marcy Plavin and friend Laura Faure. This show is full of love; love for dance and for this community. This incredible lineup of artists has come together to celebrate and honor this incredible world that has been created at the Bates Dance Festival. An evening of opulent and evocative work, these artists bring with them a history deeply influenced by the festival, by the two women who stand as pillars. Before, during, and after the show, we find ourselves returning to sentiments of gratitude. These sentiments live deeply within us, they always have; sentiments we sprinkle through the movement of our lives, reinvigorating the spirit of the Bates Dance Festival everywhere we go. For that, we have Marcy and Laura to thank. This post was written by Phoebe Ballard. Phoebe is the BDF social media intern for the 2017 summer.